The Product Mix Report shows the breakdown each product's sales. It is powerful tool to provide insight on the best selling items and most profitable items. The pie chart shows the top ten products, either by product profit (this requires inputting product cost) or by quantity sold. There will be a large portion of the Top 10 Quantity Sold that is assigned to Other, which contains all products that do not fall in the top 10 slots. 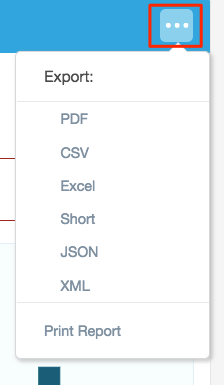 Note: Filtering by Employee in your Product Mix Report will show the items that employee has added to all orders. If you'd like to show the employees orders instead of items, go to Settings > Clear Selections > type Product Mix > disable Product Mix Employee Sales Mode. Disabling this setting will show Product Mix data by the employee who owns the order, instead of the items sold by the employee. Top 10 Profit By Product Pie Graph: The pie graph on the left of the screen displays your top 10 most profitable products. This is based on product cost and product price. You must have product costs entered for your items in order for this graph to display. Please Note: If you have opted for the auto-delivery of your Product Mix Report (under Settings> Email Address> Product Mix Daily Report), the emailed report will provide you only the default details, not your customized selections. 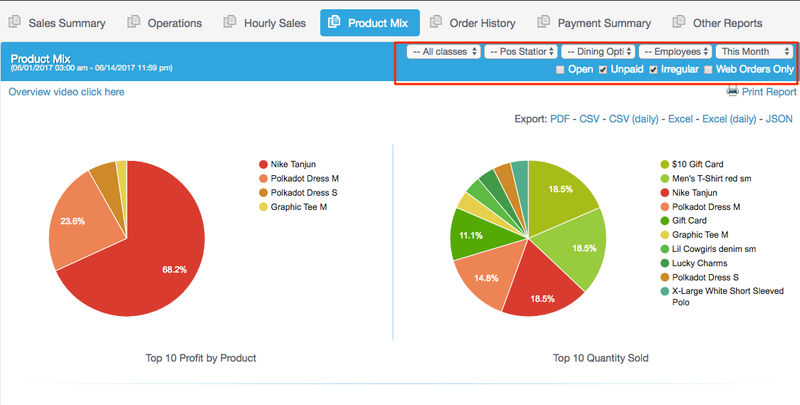 To view your Product Mix Report by your customized selections you will have to do so in the Management Console. If you include products and modifiers in your report, the total displayed for each modifier will be the number of products with that modifier sold. If more than one modifier has been added to a particular product, the total number of products sold and the total number of modifiers sold won't be the same on your report. For instance, if your modifier is Toppings, and you've sold one large pizza with pepperoni, mushrooms, and black olives, your report will show 1 large pizza sold under products and 1 each sold of pepperoni, mushrooms, and black olives under modifiers. Your modifiers add up to 3, but only 1 pizza was sold, so the total under products will still be 1. This allows you to accurately track and compare modifier sales. This message occurs because there are orders that have either been left open for an extended period of time that falls outside the reporting period, or which have been opened and reopened outside the reporting period, perhaps to perform a return or exchange. Sales, payments, returns, and refunds shall be reported on the date the event occurs.